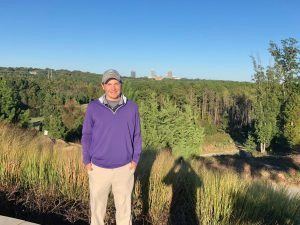 Jackson Spires fired a second round 69 in cool, blustery conditions to claim his second victory of the year in the 2018 Tour Championship @ NC State University’s Lonnie Poole Golf Course. Spires’ 2 day total of 138 (-6) edged David Kocher (-5) , who’s 68 was the low Sunday round, by a single shot. In addition to winning the tournament, Spires claimed the $1000 bonus for winning the Series 3 Points Race. In the Am Division Stephen Lavenets came back from 5 down to start the day with a solid 75 to claim victory. James Kasza claimed the Am $250 bonus gift card for winning the Series 3 Points Race. Thanks to all competitors who played this week as well as those who participated in any tournaments throughout the year. 2018 was a great year as the Tour continued to grow. Check in on social media and the website throughout the offseason for announcements and updates on the 2019 season. See you next year!!! Sunday’s final round tee times for the Tour Championship @ Lonnie Poole Golf Course are now posted in the “Pairings” section. In first round play, Zach Edmondson paced the field with a solid round of 68 (-4) to take a one shot lead over Jackson Spires and Stanhope Johnson. In the Am division, Sumner Tate rushed out to a 3 shot lead with a round of 73.